Iris Yellow Spot Virus (IYSV) was first discovered in the U.S.in 1989 infecting onions in the Treasure Valley of Idaho and Oregon. IYSV typically does not kill plants; however the virus reduces plant vigor and bulb size. Once plants are infected with IYSV, there is no cure. The virus is transmitted to onions by the feeding of an insect: onion thrips. The disease spreads rapidly in fields with large numbers of thrips. Losses up to 100% have been reported. 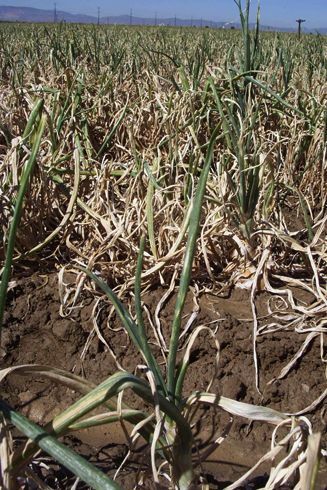 Onion thrips populations are reduced by the application of insecticides in onion fields thus preventing transmission of the disease to onion plants. “Iris yellow spot virus pressure in this region has not been nearly as bad as it was last year, when it wiped out some onion fields. “The virus seems to have been held off well this year,” said Paul Skeen, who farms near Nyssa, Ore. Farmers in the Treasure Valley area of southwestern Idaho and eastern Oregon produce about 25 percent of the nation’s bulb onions and the virus is one of their main production challenges. It weakens the plant and reduces onion production. It can substantially reduce onion bulb size, which is important because larger onions fetch a higher price. The disease is spread to onions by thrips, and Skeen said many growers in the area started spraying for thrips earlier this season and they sprayed more often. Skeen started spraying 10 days earlier and sprayed every seven to 10 days as opposed to every 14-20 as he has done in past seasons. “I’ve got a good crop coming because I stayed on top of it. I think everybody’s been doing that,” he said. While onion growers in the Treasure Valley area typically start their thrip spraying programs around Memorial Day, many started in early May this year, said Stuart Reitz, an OSU cropping systems extension agent in Malheur County. While onion growers in this area normally make about six applications for thrips in a season, many have made eight or nine already this year and a few are up to 10, he said. “That helped keep the thrips population down,” Reitz said. Title: Onion virus pressure not as severe as last year. Source: Capital Press. August 8, 2014. This entry was posted in Insecticides and tagged Idaho, insecticides, Iris Yellow Spot Virus, onion thrips, onions, Oregon, plant virus, Treasure Valley, U.S.A. by pesticide guy. Bookmark the permalink.